There is currently just the 1 ferry route running between La Graciosa and Lanzarote operated by 2 ferry companies – Biosfera Express & Lineas Maritimas Romero. The La Graciosa (Caleta del Sebo) to Orzola ferry crossing operates daily with a scheduled sailing duration from about 25 minutes. Whilst we’ve taken great care to ensure the information on this page is correct, as the frequency and duration of crossings on all routes can vary from time to time we’d advise that you get a live quote for current availability on this La Graciosa Lanzarote crossing between La Graciosa (Caleta del Sebo) and Orzola. La Graciosa lies just off Lanzarote’s north coast in the Canary Islands, situated in the Atlantic Ocean off the African coast. 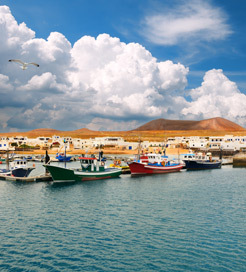 With a day trip to La Graciosa, you can fill your itinerary with a range of activities like sailing, banana-boating, hiking across the arid terrain and sunbathing on exquisite beaches. Devoid of tourist hotspots and commercialisation, it also offers the peace and quiet that some Spanish islands fail to deliver. It has just one sleepy village called Caleta del Sebo on the east coast, making it a great spot for those seeking somewhere off the beaten track. 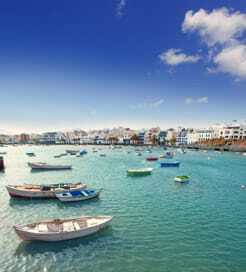 The island’s port is in Caleta del Sebo, where there are frequent crossings provided every day to the popular island of Lanzarote, operated by popular local ferry companies.